Shitamoe is a popular wagashi motif for early spring. The word shita means "under" or "underneath" and moe, "sprouting" or "shooting out." In the photo above, you see the green between the brown and white parts? It is symbolic of sprouts coming out from the dark, winter soil underneath the snow. Japanese people have loved the liveliness of grass sprouts as an early sign of spring and the word shitamoe has been widely used in Japanese traditional poetry. I found an English recipe here, if you would like to give it a try. It seems to be a recipe for two-layered ukishima in white and green, but if things like shiroan (sweetened white bean paste) and matcha (powdered green tea) are not available, I guess you can use azuki-an (sweetened azuki bean paste) only and make brown ukishima like this photo (scroll down and click on the watashi photo to enlarge). But of course if you are more ambitious and can get (or make) shiroan, you can experiment on beautiful ones like this, this and this. If you can't find joshinko (rice flour made from nonglutinous rice) called for in the recipe, you could substitute it with mochiko (rice flour made from glutinous rice) or just use wheat flour only, because I've seen ukishima recipes like that, too. It would make a little difference in the texture: mochiko may make it more chewy and sticky, and using wheat flour only may make it more cake-like?? But I don't think it would ruin the whole thing (hopefully). Ever since I started working at the supermarket, I have been craving sweets, especially cakes. After my work from dawn to lunchtime, I come back to my apartment and see bright afternoon sunshine coming through the lace curtain. Yes, it's my favorite time of the day. BTW, the candied citrus peels in this pound cake were made from buntan citrus from dad's orchard, and as you might have guessed, it was my mom who made them. 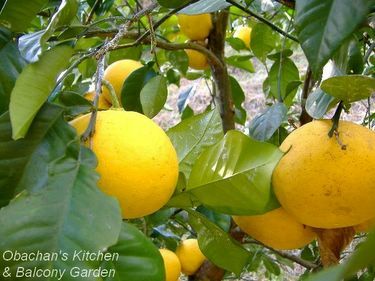 Buntans look pretty similar to grapefruits, but they are less juicy than grapefruits and taste sweeter. The rind is much more bitter than that of regular oranges, but after the bitterness is largely removed by repeated boiling and soaking in water, buntan rind can make good candied peels with the remaining bitterness balancing out the sweetness of granulated sugar. Yes, I admit it. There's nothing wrong or outrageous about making candied buntan peels. Yes, I’ve survived another week at my new workplace, a small supermarket, and yesterday was the first payday. Of course the pay was very small because I started working there in the middle of this month, but it made me so happy. If I don't get fired for some reason, from next month on I’ll be able to pay all the bills, buy groceries and still have a little money left in my bank account. Yeah, mediocrity. I know. But in this country, if you are a single, middle-aged woman living in a rural town, even such a mediocre success can be hard to achieve sometimes. I mean it. Anyway, let me tell you what my days are like now. I wake up at 5:50 am every morning and spend good 5 minutes to make myself “cold-resistant” by putting on warm clothes including “high-tech” underwear and several pairs of long socks. Then I have a big breakfast because I won't be able to have lunch until around 2 pm. After that, my mentor and I start packing the fillets and sashimi (sliced raw fish) the two guys prepare one after another. There’s an automatic wrapping machine there, and we punch in different code numbers to wrap up the seafood in Styrofoam trays with plastic food wrap and put proper stickers on them. Now, I don’t know if this is the same in other countries, but here in Japan, learning fish names can be a nightmare. The classification is so detailed -- for example, I have seen 4 or 5 different kinds of horse mackerel so far -- and complicated by special local names. Some fish are called by different names as they grow. I wonder how non-Japanese people being trained to be sushi chef feel about this. Don’t they think it’s crazy? So there ARE challenges, but I guess I’m enjoying my work there. Maybe it has a lot to do with the fact that I was born and raised in a small fishing village until I was 12 years old. In my childhood, I often went to the local fishing port, and sometimes accompanied dad when he went fishing. The fishy smell or grotesque-looking fish scraps I smell/see at my work now are, of course, not very tempting, but those make me feel somewhat nostalgic rather than totally disgusted. That’s probably why I’m feeling better than the time when I was working at the bento shop. Today was my first day off at the new daytime job, and I was determined to bake something to celebrate my survival. Yes, survival. You know, I have never been an early bird (except for the times when I had to get up early for certain reasons), so getting up at 5:50 am every morning for 6 days in a row -- in the middle of winter -- was certainly a challenge for me. I forgot to set the alarm off last night, so I woke up at 5:50 am this morning as usual. But it was nice to stay in bed, feeling happy about not having to rush to work. Happily dozing off once in a while, I thought about what to bake today, and finally decided to go for cinnamon rolls. Sorry, those who gave me wonderful cinnamon roll recipes about a year ago when I gave it a try for the first time. Today, I thought about trying one of yours, but I just didn’t feel like doing the conversion! So I took an easy way out, which means, I, again, relied on ”allrecipes.” (The site takes care of U.S.-metric conversion as well as changing the serving size.) This is the recipe I picked this time, but I baked mine in a square pan instead of muffin cups. These are no-butter and no-egg brownies that I baked a couple of days ago. At that thime I didn't even think about St. Valentine's day, but today is the 14th and I still have some of these left, so why not. When making a simmered dish with daikon radish, it is generally recommended to pre-boil it with a little amount of raw rice or in rice rinsing water until a toothpick can be inserted easily. It is a well-known tip here in Japan, but most of us do not know the scientific reason behind it (or if there is one at all). So, having been triggered by a question from someone who read my buri-daikon post, I did a bit of net research. Let me share the result with you. In a nutshell, the pre-boiling process mentioned above is supposed to remove the slight bitterness or harshness of daikon and make simmered daikon soft and tasty. They say that adding rice, or using rice rinsing water for this process means boiling daikon in a colloid solution, and the bitter substance contained in daikon will be adsorbed onto the colloidal particles during this process. On the other hand, some people do say that using raw rice or rice rinsing water is not necessary; pre-boiling in regular water is just fine. Or some even say that pre-boiling is not necessary at all because these days daikon radishes do not have such strong bitterness. Confusing, isn’t it? What I do -- as a sort of compromise solution-- is: do pre-boiling for simmered daikon dishes with light seasoning, and skip it for those with heavy seasoning. To me the best example for the former is furofuki-daikon, and the latter is oden or buta-bara daikon (daikon simmered with pork ribs). I put buri-daikon (daikon simmered with yellowtail) in the former category, because the fish has the risk of giving an unwanted fishy flavor to the dish, so I don’t want any additional unwanted flavoring from the daikon. Personally, I believe that this pre-boiling trick makes a big difference when you want to enjoy the delicate taste of daikon itself with light seasoning. Now, I was also asked for a tip to avoid bitter daikon and choose good ones. But sorry, I still cannot find an answer. The problem was that there were many websites talking about the “pungency” of daikon, but not exactly about the “bitterness.” They say that the pungency is caused by a substance called isothiocyanate, and its precursor substance is contained more in the tail end and near the skin. Thus, there are ways to deal with the pungency; advices about which part is suitable for what kind of dish are available almost everywhere. Now what I don’t know is whether the bitterness is caused by the same substance, isothiocyanate, or not. My hunch is probably “No,” because simmered daikon can be bitter without any pungency. Then I have no idea if there is a way to avoid certain bitter parts in a daikon or tell bitter daikon from non-bitter ones. Harvest season or fertilizers used may make some daikon more bitter than others, but how can you check out such information when buying one at the store? So all I can say is, "To choose good daikon, choose fresh ones. And if worried about bitterness in simmered daikon dishes, don't skip the pre-boiling." That's about it. Sorry. As for the softening effect, some say that an enzyme contained in rice bran makes daikon soft, though I couldn’t find any site clearly mentioning the name of the enzyme. But in my experience, daikon did soften quicker when a little amount of rice or rice-rinsing water was used for pre-boiling. After chopped daikon are "pre-boiled"with raw rice or in rice rinsing water, they need to be drained, rinsed with running water and then cooked in water and seasonings. You don't want to use the colloid solution from the pre-boiling for cooking and seasoning the daikon, of course. My colleague at the language school bought a macrobiotic cookbook recently. She let me read it while at work, and this recipe caught my attention. The dish is called renkon hambaagu. Renkon means lotus root in Japanese, and hambaagu is the Japanese name for hamburger steak or Salisbury steak. Basically, what this is is fried lotus root pate (if I can call this a 'vegetable pate') with soy-based sweet-n-salty sauce. Grated lotus root is the main ingredient. And the neat trick is that crushed yaki-fu is used in place of bread crumbs. So what is yaki-fu? It is dry baked wheat gluten, according to wikipedia. I usually use it for soup or simmered dishes, but never thought about using it for something else. And crushing it to use it as a substitute for bread crumbs was a totally new idea to me. Yes, I like this idea very much now. The baked wheat gluten I used this time was mochi-fu, a chewy type of yaki-fu. Maybe that was why my renkon hambaagu turned out pretty soft and elastic. I liked that. And the roasted sesame seeds I added to the pate (though it was not mentioned in the original recipe) was a good accent. The ingredients of my sauce were soy sauce, water, mirin, minced ginger and a little sesame oil. The original recipe called for mushrooms, which I omitted this time. I will give it a try next time. Another thing I really want to try next time is adding chopped shrimp to the pate. I think it would add a nice flavor and go well with the sauce, too. * Original recipe from: "Macrobiotic Hajimemashita"
I crave Mexican food once in a while, and for some reason, it's usually on Saturday. (The post from 2005 was posted on Sunday, but the dinner was made on the night before.) I wonder why. Maybe it has something to do with the way I spent many Saturday nights in the U.S. more than 10 years ago? You know, Taco hell, coors light and Saturday Night Live?? Now I am an obachan and my Saturday nights are a lot less exciting, but I still feel like Mexican food on some Saturday nights. And yesterday at the import food shop at the mall, I found something very tempting. Yes. The instruction on the package said "Just add vegetable oil and water." Sounds easy. And I can actually make hard taco shells in my kitchen? Wow! I have to give it a try! Take a look at my very first home-made hard taco shells! Unfortunately, they didn't turn out very crispy. But it was fun to make them, though I broke one of the shells when folding it. The biggest mistake was that I forgot to buy salsa. I tried to make something similar with the ingredients I could find in my kitchen, but it was undoubtedly a bad idea. Yes, what I made tasted sour and spicy. But it just didn't taste like salsa.